The Repair Bill: Oh Noeesss! Wow I just realized that unless I run Kara tonight and get a lucky drop, this will be the first week in a long while in which I’ve gotten no purples! 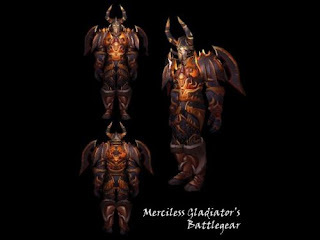 This makes me very sad in my pants and we most certainly cannot have that, so I may have to jump out and spend my arena points on a piece of Merciless Gladiator's Battlegear. Speaking of arena’s, the Jackson 5 got SPANKED. Out of 10 games we only won 1. I’m hoping in a few weeks we can start meshing better and pull ourselves up to winning half of our 10 games. On my 2v2 and 3v3 teams we have started getting better, this week my 2v2 went 7-0, and my 3v3 team went 6-4(3v3 previous week was 9-2). During the weekends I have been going with an Arms spec so while I’m in an arena battle my biggest asset to the team is Mortal strike and execute which I have been trying to apply to the opposing team’s healer. Which the issue we have been struggling with in arena’s is that we have not been able to mow down their healer as fast as they kill off ours. I spend a lot of my 5v5 battles chasing the healer. It’s really irritating when I’m chasing a druid who keeps shape shifting out of any slowing effects (If you’re that druid that kept doing that to me this weekend, you better tell your family and friends goodbye cause I’m going find you in RL and your eyeball is going to grow a knife). Everyone on my team keeps saying it’s a gear issue but I know enough graphics to recognize that many teams we play are close to equally equipped, so I’m thinking our biggest problem is a “Mesh” issue. What also doesn’t help is that all 5 of the team members know each other in real life, so where some people might hold their tongue and not yell at a fellow gamer that rule doesn’t apply here. There was so much yelling and insults that I almost made my own duel flag out of cardboard, a broom, and went to a buddie’s house and threw it down in his front yard. My plans for tonight are a little bit of pve, unless I am assassinated tonight by one of my team members I’m going to respect back to prot and either hit up Kara or maybe do a heroic run. Repair bill: Since its been almost a week since my last post i forgot to keep track of repair costs, but since i havnt run anything really this week it should have been pocket change.